I've had more than a passing interest in the splash arrival this month of Steven Spielberg's movie The Post, starring Meryl Streep and Tom Hanks, which covers the Washington Post's role, in 1971, in publishing the so-called "Pentagon Papers," a top-secret government study of United States involvement in the then-still-raging Vietnam War. Judith Ehrlich and I spent four years creating the on-screen story of the man who leaked that Pentagon study to the press, in our 2009 documentary, The Most Dangerous Man in America: Daniel Ellsberg and the Pentagon Papers. So I've been waiting with bated breath to see what this stellar Hollywood team would do with similar events. I first learned about the Spielberg film six months ago, through a long article in the Columbia Journalism Review, titled “Hell hath no fury like The New York Times scorned by Hollywood.” Indeed, the Pentagon Papers story was broken in June 1971 by the Times, with three days of front-page articles accompanied by excerpts from the top-secret documents, and the newspaper's revelations were then re-reported by every print and broadcast news organization in America. This led to immediate attempts at government suppression by then-President Nixon, culminating in a court injunction stopping the Times publication after three days of articles. This, in turn, motivated Ellsberg to get copies of the Pentagon Papers to the Post (and later other newspapers). The Washington newspaper picked up the ball and published its own front-page story within 24 hours. At first glance, it was puzzling—and enraging to many of the Times' former reporters, editors and lawyers who were responsible for breaking such an important story 46 years ago, at great risk to themselves and their newspaper—why, in 2017, Hollywood, to tell such a journalistic tale, would go to the second paper to report the story. As the CJR article reported, Liz Hannah, the originator and scriptwriter of The Post, says the movie "is not a whistleblower film. It is not about, necessarily, the Pentagon Papers. It's about this woman [Washington Post publisher Katherine Graham] and how this event ended up being what changed her." But Hannah sold her script last fall, meaning before the last presidential election. The project picked up steam earlier this year, and Spielberg, Streep (as Graham) and Hanks (as Post executive editor Ben Bradlee) subsequently signed on. My understanding is that the film was whisked into production for a 2017 release, at least in part because of the deep threats to freedom of the press in America coming from our new president. Trump was incessantly accusing the Times, the Post, CNN and any other reputable news organization that didn't cater to his view of the world, of "fake news," as well as endorsing physical attacks on reporters and restricting access to press briefings. Defending our news media, who "afflict the powerful" when at their best and whose investigative persistence is essential for a vibrant democracy, became a worthy and urgent project for socially-conscious Hollywood moviemakers. I watched an advance screening of The Post very recently. Freedom of the press is certainly more than just an incidental theme of the film. The case for the importance of aggressive and uncompromising journalism without government intervention is made strongly and convincingly. Yes, it is true that this film, at its heart, is about the evolution of a privileged-but-insecure woman in a male-dominated world, who takes risks with very serious possible consequences and comes into her own, but this, too, is a story that is equally timely, and one that is well told. Still, I walked away mulling what was perhaps sacrificed in The Post's streamlined portrayal of such an epic, multi-faceted event in American history. First, the movie gives short shrift to the dedication and drive of the newspeople who actually put together the Post's Pentagon Papers stories from 4,000 out-of-sequence pages of top-secret documents—who wrote the copy, made these complicated events about Vietnam War decision-making, government secrecy, deception and abuse of power understandable to the public, all the while being under siege by the lawyers encouraging Graham not to publish. In particular, the real-life Ben Bagdikian, the Post assistant managing editor who got the Papers from Ellsberg and worked in concert with Bradlee convincing Graham to publish, was portrayed (by Bob Odenkirk) as sort of bumbling, tentative and subservient to Bradlee. (Full disclosure: Bagdikian was a close adviser of mine going back to 1989, and appeared in not only The Most Dangerous Man in America but my previous documentary feature on independent journalist and press critic George Seldes.) In reality, Bagdikian was dogged and determined throughout this episode, and played an even larger role than the movie shows, in ensuring the Post did go ahead and publish. Bagdikian uttered the most famous, and perhaps most decisive line (given to Hanks' Bradlee in The Post, not once, but twice) of the whole intra-newsroom battle: "The way to assert the right to publish is to publish." Bagdikian was a crack and fearless journalist, a hero to his peers, and then an influential media critic for decades, well after his time at the Post. Perhaps the documentary form is better suited than a scripted, fictionalized portrayal, to bring out the passion and reveal the heart and soul of human efforts. In our film, Times reporter Hedrick Smith recalls his and fellow reporter Neil Sheehan's excitement when they first read the classified Papers that Ellsberg gave them: "Look at what we've got! The raw, top secret, eyes-only documents! From Earl Wheeler to General Westmoreland, from Johnson to Taylor…I remember writing this story; these guys were lying through their teeth when they were talking to us! And here it is in black and white; there's no way of denying it!" Smith's enthusiasm is riveting, and his journalism showed it. Times editor Max Frankel, recalling the critical dilemma of whether or not to publish, says in our film, "Lurking in the backs of our minds was the fact that we would never survive just suppressing this material. That sooner or later, it would be known that we had it and that we had flinched and that we had not published it. And that that would have been such a disgrace." And Times attorney Jim Goodale, articulating the importance of standing up to the federal government: "I mean, what in God's name have we been fighting for in this country for two or three hundred years to have the right to speak, the right to publish, the right to think, against a threat by the government, if all we're gonna do is give it all up because someone sends you a telegram?" These sentiments, delivered by real people, being themselves, have a power and persuasiveness that is difficult to replicate with script and actors. And then there is Dan Ellsberg himself. The Post (with Matthew Rhys as Ellsberg) did not do justice to him as a human being nor as an activist. 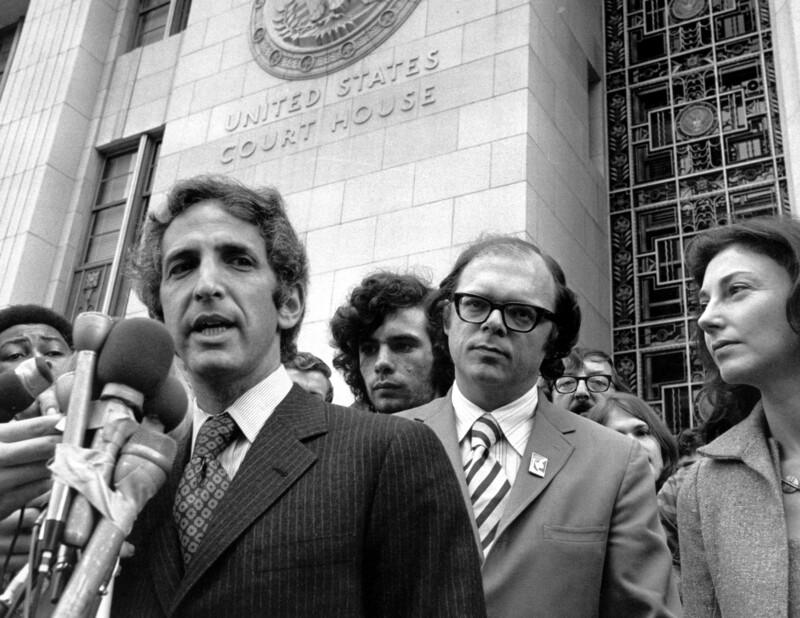 What Ellsberg projects—whether in 1970s archival footage, on-camera presence in our film or in real life today—is an unwavering commitment to acting on conscience—"casting your whole vote, not a strip paper merely" (to quote Thoreau, as Ellsberg does often). He is bold, charismatic and has continued, since his Pentagon Papers days, to inspire others to take risks, step up and make a difference in the world in ways you wouldn't have thought you could. The Most Dangerous Man in America opened at the Toronto International Film Festival in September 2009, got nominated for an Academy Award, had a four-month theatrical run and was broadcast by POV on PBS, and subsequently in more than 30 countries around the world. During our festival and theatrical run, Judy and I, often joined by Dan Ellsberg and his wife, Patricia, engaged theater audiences for spirited Q&As. Discussion revolved around how to stop the current wars; secrecy in government; whistleblowing, especially when Wikileaks hit the news in early 2010 with Chelsea (then Bradley) Manning's leaks about Iraq; and "how do we revive the kind of widespread political activity that was so prevalent, and often effective, during the Vietnam era?" Of some concern to me was the average age of the audiences, which was surely upwards of 55. Not a surprise, given the subject matter (to anyone younger than 40, the Vietnam War was ancient history), but my goal as a documentary filmmaker has always been to make films that would resonate with a younger generation. Judy and I did reach young people in the way we'd hoped—through public screenings, but also through activist organizations, high schools and colleges, where the film continues to be used nationwide. We, like most documentary filmmakers, are always looking for vehicles for our film to be more impactful. Somewhat later, I did discover that our film had a profound effect on one 29-year-old self-described "cyber-strategist" who, remembering watching The Most Dangerous Man in America in 2012, told one audience in Dresden, Germany, "Seeing what [Ellsberg] did, seeing the choices that he faced, seeing how he struggled with the same moral complexities that I myself was unable to resolve, helped me see that there was a model that was established…[and] that it is not enough to recognize that something is wrong, it is not enough to simply raise a complaint. …. We have not just the right, but the moral obligation, to ourselves and our societies, if we have the capability to do something, to achieve a positive result, for our families and the futures of our countries." Edward Snowden, NSA whistleblower, was on Skype from Moscow, and had introduced himself to an audience honoring Ellsberg as the recipient of the 2016 Dresden Peace Prize, saying, "I don't think it is an exaggeration to say that without a Daniel Ellsberg there could not have been an Edward Snowden." A convergence of happenings this month promises to bring Most Dangerous Man to new audiences. Besides the opening of The Post, Ellsberg has been appearing publicly all month on radio, TV and at public events, in conjunction with his new book, The Doomsday Machine: Confessions of a Nuclear Planner—all too timely, especially in light of the new games of nuclear-war "chicken" that are being played by two of the world's most irrational leaders. In addition, The Most Dangerous Man in America has been picked up for nationwide cablecast by MSNBC, with multiple airings beginning on December 23. So audiences across the country and beyond will have ample opportunities to view both Pentagon Papers movies, and judge for themselves how a good Hollywood movie about influential decision-makers can be enhanced by a deeper understanding—and through their own accounts—of the many people who took great risks (as well as Nixon Administration officials who tried to stop them) to inform the American public about the truth of US actions in Vietnam. "Every film has two important time periods," said Dee Rees, director of this year's excellent Mudbound, a story of black-white relations in 1940s Mississippi, at a screening this past October at the Mill Valley Film Festival. "That when the action takes place, and that when the film is made. The film must be true to the era of the film's setting, but is mostly relevant because of what it says about the world at the time the film reaches its audience." Both The Post and The Most Dangerous Man in America have much to say in these dark, challenging political times, when the need for hard-hitting journalism is more important than ever, and being willing to "cast one's whole vote," individually and collectively, may be our best path back into the light. To find out how to view The Most Dangerous Man in America: Daniel Ellsberg and the Pentagon Papers, go to mostdangerousman.org. For educators, go to New Day Films. Rick Goldsmith co-produced and co-directed (with Judith Ehrlich) The Most Dangerous Man in America: Daniel Ellsberg and the Pentagon Papers (2009), and produced and directed Tell the Truth and Run: George Seldes and the American Press (1996), which, like Most Dangerous Man, was Academy-Award-nominated for Best Documentary Feature. His latest documentary is Mind/Game: The Unquiet Journey of Chamique Holdsclaw (2015). He is married with two daughters and lives in Oakland, CA.